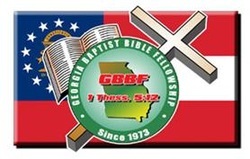 The Georgia Baptist Bible Fellowship has existed in some entity since 1958. It was first a part of the Tri-State (GA, SC, NC) Baptist Bible Fellowship and the GA/SC Baptist Bible Fellowship. In it’s present entity, the Georgia Baptist Bible Fellowship was organized on February 10, 1973, at Smyrna Baptist Temple, Smyrna, Georgia, where Dr. Harry Rudasill was pastor. The fellowship was organized at the urging of Dr. Jewell Smith, who was, at the time, Pastor of Temple Baptist Church, Orlando, Florida, as well as the District Fellowship Director of the Baptist Bible Fellowship International. Dr. Smith was the speaker at the organizational meeting. The GBBF has now been active for 28 years. The fellowship was organized by a group of men who saw the need of encouraging one another and had a burden to help start independent Baptist churches in the state. Some of the founding pastors were Gus Groover, W.F. (Tommy) Tompkins, Harry Rudasill, Cecil Hodges, Don Davis, and Tim Neal. From these few, the GBBF has grown into a network of pastors from all parts of the state, who share this same vision of church planting and encouraging other preachers.